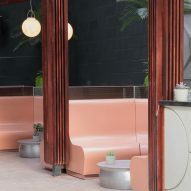 Curved openings and salmon-pink furnishings appear throughout Night Tales Bohemia Place, a new east London bar designed by Sella Concept. Occupying two arches beneath Hackney Central train station, it is the latest in a series of Night Tales venues that have opened in the UK capital in the past five years. Design studio Sella Concept was charged with developing an aesthetic for the space, which plays host to a nightclub, a pizza parlour and a 370 square-metre garden. 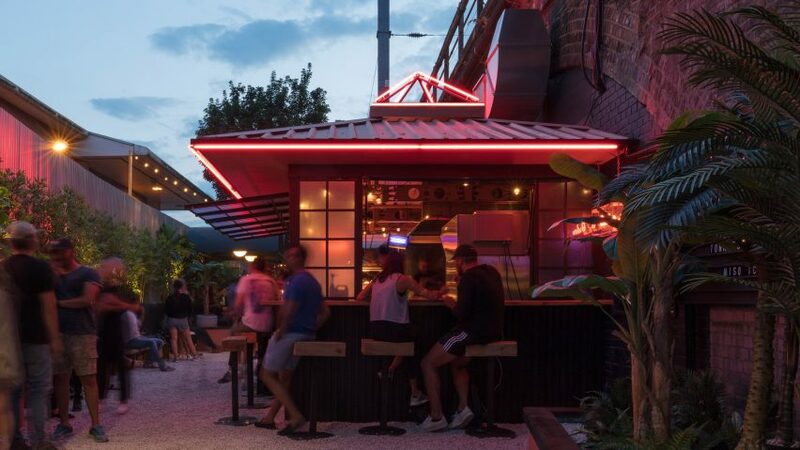 The designers were asked to "connect the disparate parts of [the bar] into a coherent, impactful whole", while subtly drawing on the identity of the Japanese bar and grill that forms part of the venue. "The key was to create a scheme to link all the areas through colour, materials and behaviour," Tatjana von Stein, co-founder of the studio, explained in a statement. "We wanted to stay away from the usual east London bar aesthetic of industrial chic and the traditional Japanese theme, so we pushed the parameters of both." With the help of construction company Halo Group, the studio added a series of curved doorways throughout the space, in reference to the form of the railway tunnels. This shape also crops up again in the garden, in the vaulted frames that shelter daybeds. A pink colour scheme features throughout – an attempt to brighten the arches, which had previously accommodated an auto repair shop. Salmon-coloured resin forms a series of booth seats, while rose-hued circular mirrors provide decoration. Fuchsia strip lights are also integrated into the roof of one of the bar stations, to direct attention to the trains passing. 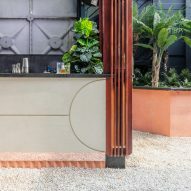 Pale concrete fronts the counter of the main bar, while columns and canopies are made from thin slats of cherry timber. Sella Concept is led by Tatjana von Stein with Gayle Noonan. Earlier this year, the studio used peachy tones for the surfaces of Omar's Place restaurant in London's Victoria, complemented by brass and sage-green furnishings intended to evoke the warmth of the Mediterranean.